Is that a Woodpecker in your birdfeeder? | Yobot Inc.
Is that a Woodpecker in your birdfeeder? We’ve trained the woodland animals living in our yard. They lie in wait, watching the empty birdfeeder for the inevitable refill, and once we refill it – mayhem reigns in the yard. 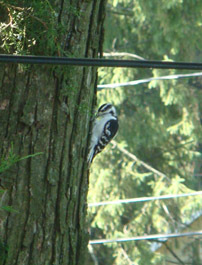 The chipmunk was in the birdfeeder cage and the woodpecker would swoop in for a snack. He and the chipmunk were duking it out. Puddem Up!